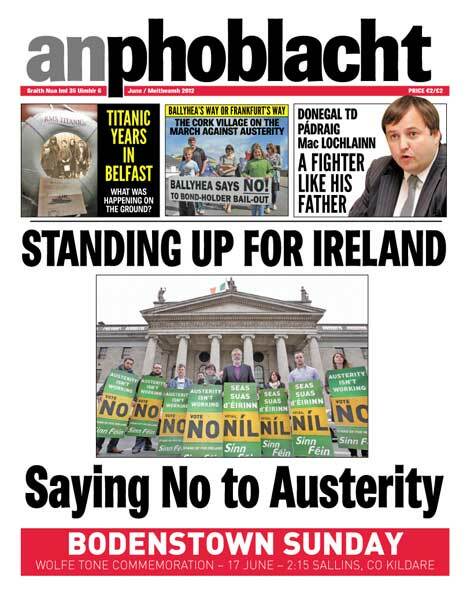 THE JUNE ISSUE of An Phoblacht is out now with top features including Ballyhea’s Way or Frankfurt’s Way, the Cork townland folk on the march against austerity and EU giants (and they’re on their way to Frankfurt!). Jim McDermott has a two-page focus on ‘Titanic Years in Belfast’ – while all eyes were at sea, what was happening on the ground? Donegal TD Pádraig Mac Lochlainn talks to Mark Moloney about the political influences of his late father, a republican prisoner in England, and charismatic Donegal County Councillor Eddie Fullerton, shot dead in his Donegal home by a UDA death squad. The inquest into the SAS execution of IRA Volunteers Dessie Grew and Martin McCaughey is reported by Peadar Whelan, while Mark Moloney covers the programme of events to honour the Loughgall Martyrs. Way down south, in ‘The Real Capital’ of Cork City, Sinn Féin councillors have rattled the Mayor’s chains by challenging big expenses and costly trips while citizens face cuts, provoking an extraordinary outburst by the Fianna Fáil First Citizen against republicans. Alongside the Cork Mayor’s carry-on, Eoin Ó Murchu asks where has Fianna Fáil’s radicalism gone. We have self-confessed “EU geek” Eoin Ó Broin reviewing the Austerity Treaty referendum campaign as West of Ireland Senator Trevor Ó Clochartaigh asks questions of his near-neighbour Eamon Ó Cuiv. The stiletto heels of Julia Carney turn towards the emergence once more of Seán Gallagher and Declan Ganley in ‘The Resurrection Shuffle’. Conor Maskey and his pals go to the movies to take a peek at the new film about Bob Marley while Jacqueline Kaye flicks through the book ‘Blackwater: The Rise of the World’s Most Powerful Mercenary Army’. As some of us get ready to vote in the EU Austerity Treaty referendum, Mícheál Mac Donncha in Remembering the Past recalls the militant campaign by Irish women to win the right to vote, and Michael Nolan pores over the embers of the burning of the barracks in Ballybrack, South County Dublin, in 1920. Peadar Whelan reports from the Derry convention that selected Martina Anderson to take over as MEP from Bairbre de Brún in the European Parliament, and European United Left/Nordic Green Left Group leader Gabi Zimmer says the future of Europe depends on the EU changing course. The end of the Palestinian mass hunger strike is covered, as is Spain’s bull-headed rejection of a new ETA statement and initiative to consolidate the peace process. In sports, Ciarán Kearney makes the case for equality in the Olympics, Paralympics and Special Olympics. And Gerard Magee is on the ball with that Manchester City miracle to win the English Premiership and ‘James McClean and the Twitter Machine’. Oh, and we look more closely than unionist agitator Willie Frazer did when he saw an Irish Tricolour flying from a Tyrone school’s flagpole and promptly publicly denounced it as an IRA youth camp. Bless.